Jini James of the Art Students Guild of Melbourne is undertaking a project, called simply, "Remarkable Women". Her inspirations are business-owners and professionals, painted in their working environment. The first four have been completed, all in watercolor, and the families and friends have been invited to a Preview Party at the 905 Cafe in downtown Melbourne on Saturday, November 10 from 4 to 5:30 pm. Everyone is welcome to drop by and view the show and meet the participants and the artist or stop by during the month and enjoy the art by Jini and other Guild members. More portraits will be added in upcoming months. 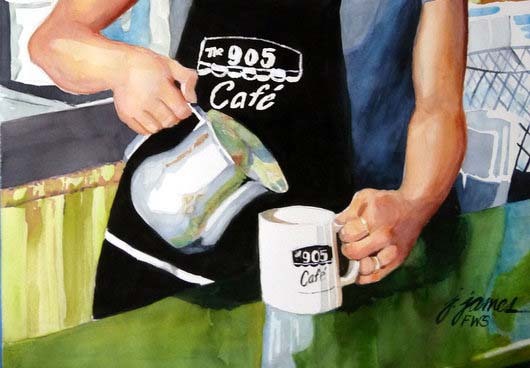 A cropped image of the owner of the 905 Cafe is included to capture interest!